It's highly unlikely that you care about the anaconda/cobra/non-venomous rat snake in my back yard as much I do...but I'm going to tell you about it anyway. We never found the snake last night. After inspecting every inch of my bedroom, I agreed to sleep in it. I did not sleep well. All I could think about was the Sherlock Holmes short story, "The Adventure of the Speckled Band." This morning, there was no sign of the snake. When I got back from the bus stop this afternoon, the snake was by the pool again. My husband was not pleased about being pulled out of a meeting at work. "The snake is back," I told him. "You have to come home right now." Not wanting to spend another night moving dressers and wall units, he agreed. 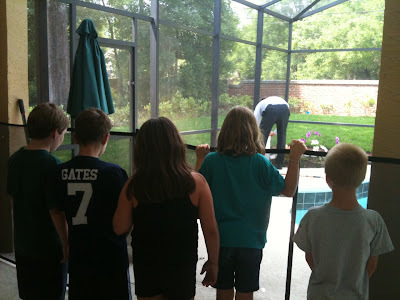 By the time he arrived, half of the neighborhood was assembled behind the child safety fence. My kids thoroughly enjoyed their popularity. Not the best angle on my husband, but what can you do? "Do you guys want an ice cream sandwich or something?" Cortlen asked. "My mom will get you one if you want." I shook my head furiously. I wasn't prepared for all the party guests. The snake did not go quietly. It took my husband several minutes to corral it into a plastic bucket. At one point, the snake struck at him. The little boy next to me tapped me on the arm. "Does he need any help?" he asked, pointing at my husband. "Because I'm a boy scout." Eventually the snake was captured, inspected, and then released into a wooded preserve by my husband's work. Everyone is happy. Except for my kids. "How are we going to get that many kids over to our house ever again?" Kellen whined. I reminded him about the alligators. I am so glad that you got the snake captured! As I read the original story I found myself searching my place for snakes and was happy to only find a couple of ants. Had one of those (same size, shape and color!) 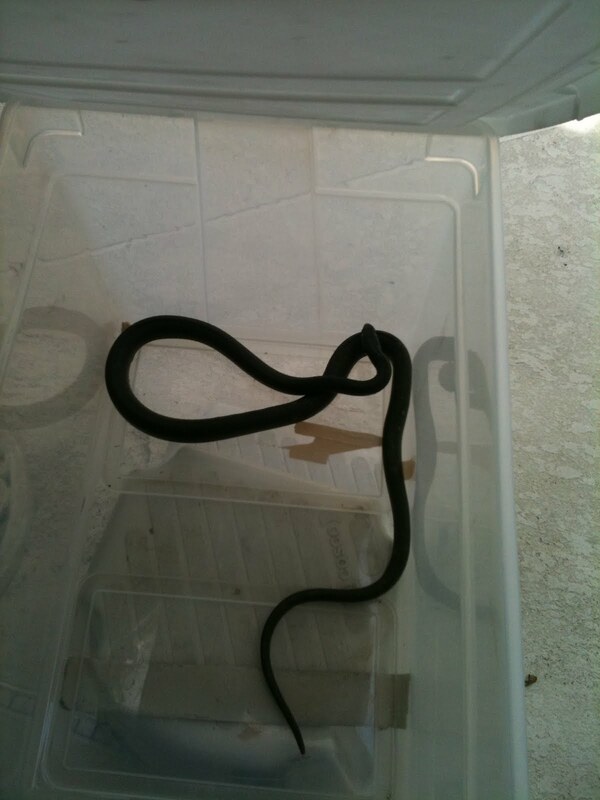 slither out next to me as I was working in my garden one summer in Houston! Still creeps me out thinking about it! I'm a boyscout! Snakes have no chance against my preparedness and one match fires. I have at least one of those in my yard. I've seen a black snake on two occasions (amd we've only lived here a litte over a month), but I'm not convinced it was the same snake both times. Our yard is backed up to a boy scout camp aka large wooded area with plenty of room for snakes to live and breed and whatever else snakes do. And I have a three year old with dreams of holding a snake. It's going to be a long summer! I can not believe there was a snake in your yard... and potentially your house. That is a nightmare come true. We recently moved to a wooded area and have seem them slithering about.. I live in constant fear. I'm glad for you that you found the snake. I wouln't have slept well either. And I love the boy scout comment. So funny! My family lived in Tampa when I was in 4th grade. I still remember my parents (or maybe some home inspector possibly) killing 2 rattlers behind our pool pump right before we moved in. And I still remember hearing the croaks of the alligators in the swamp down the street. Gotta love Florida! yikes! thats one long slithery snake. I'd move. I'm glad you guys got rid of the snake! I would think the alligators would draw at least twice as many kids. Maybe you should stock up on ice cream sandwiches, just to be prepared. I'm a little disappointed. My fondest memory from when I was nine was the time my mom hacked off the head of a huge rattlesnake (on our back doorstep) with a shovel. How could you deprive your children of such an experience?! I love Rebecca's comment. My mom saw a copperhead in the road near our house as she was driving home (think low traffic country road). So she put her station wagon (rear wheel drive) into reverse, leaned ou the drivers side window and backed up until her rear tire was on top of the snake. She then put the car in drive, stepped hard on the brakes and stomped on the gas (around here known as power breaking)...she "shredded" the snake. Lovely mom, just lovely! I happen to think it's a good angle for your hubby ;) Gotta love Florida, my boys just caught a snake in our yard (much smaller than yours) when they asked if they could keep it I told them the bumped their heads if they thought that the snake was going anywhere near the inside of our house, and the snake was lucky it was still alive. I hate snakes.....and we live out in the sticks so I get to see them more than I'd like. My neighbor opened her cabinet to get a cup an a snake popped its head out! lol, I would have had a heart attack! I have five older brothers who loved to bring home snakes as kids. One time they filled the clothes washer with water snakes. They didn't realize that some of the snakes were small enough to go down the drain holes in the washer drum. Turns out the washing machine repairman was NOT a snake fan. He stood in the hall and told Mom how to take the washer apart and get the snakes out. He did put it back together for her once the room was verified to be snake free. Have I mentioned that I have one awesome mom? Glad you caught the snake since it was bothering you, and REALLY glad you released him into the wild instead of killing him. OMG...that picture just made me shudder(is that hwo to spell it)?! That looks big! I am glad it is gone! We've had several here, too. One of my proudest parenting moments was cutting off a snake head with a shovel and then saying to my daughter 'girls can take care of anything. We don't need to depend on men... but let's just leave the snake here to die and daddy will pick it up.' There was no way I was going to touch that thing! You have alligators too? Now my kids really will be jealous! Every once in a while you hear a story about someone who went to the bathroom in the middle of the night and a snake reaches up and touches their behind. If I saw a snake, and then thought it was in my house, I could never go to the bathroom. I am glad you caught it! Holy moly, that was one long snake! Glad your husband caught it. Like you, I don't do well with creepy crawly things. I once called my almost-husband at 4am to come empty the mouse trap that had just caught a mouse. True, the trap was under the shelves in the bathroom (far out of sight) but there was no way I was going to set foot in the bathroom until the dead mouse was gone! Thank goodness for husbands. You might enjoy Rex Stout's Fer de Lance. We will ALL sleep better!!!! whew...but, I'm still creeped out!!!!!!!!!!! Yuck. My spine shivers just thinking about it! I don't know how you mustered the courage to sleep in your bed last night!!! That boy scout comment makes me want to run out and sign my oldest up for scouts. So sweet. My mom recently found a rattlesnake curled up under her computer desk. I feel your pain. I think I'd have a heart attack if I found that thing at my house. "Because I'm a Boy Scout"....oh wow, that one made me laugh out loud! OMG that is an ugly snake....I felt for you and glad that it is gone!!! Happy sleeping! Holy moley that snake is HUGE!!! You crack me up. I am so glad I was introduced to your blog and now follow you every day! Glad you caught it. I too had dreams about snakes. You probably should have kept it though. It may eat bad snakes and future (more) rodents. Just seal your porch up tight. When we bought our house the house inspector found a black snake under our house and asked what we wanted him to do with it. I told him to put him back under so he can do his job! Totally different story if it was in the house! !